No turtles were sunbathing this weekend - or people either for that matter. Three days of cool, damp, rainy, drizzly weather prevented that activity! At least it makes for deep color in the foliage as the filtered, indirect light brings brings out high saturation in their colors. But no blue skies in the background! Last week I noticed the red maples turning in the wetlands of Lake Wicwas. This week, with more color in the leaves and the cloudy lighting, they really stood out, causing me to notice just how many trees are growing back into the large wetland along the east side of Chemung road. The tall dead trees in the swamp indicate it was once a forest. I expect many years ago beavers dammed a stream to flood the area, killing the trees in the process. Beavers are the only animal other than man that make major changes to the environment for their own purposes. They build dams to form the ponds they use for food (aquatic vegetation that grows there), for their homes, and for protection from predators. We can be pretty certain the dead snags are all pine and hemlock, as those are the two trees beavers really don't like; they would have taken down all the other trees in and around their pond. But quite some time ago they abandoned their self-made pond. This is another way beaver are like humans: once they have depleted all the resources in an area, they just abandon it and move on to take over another forest for their home. 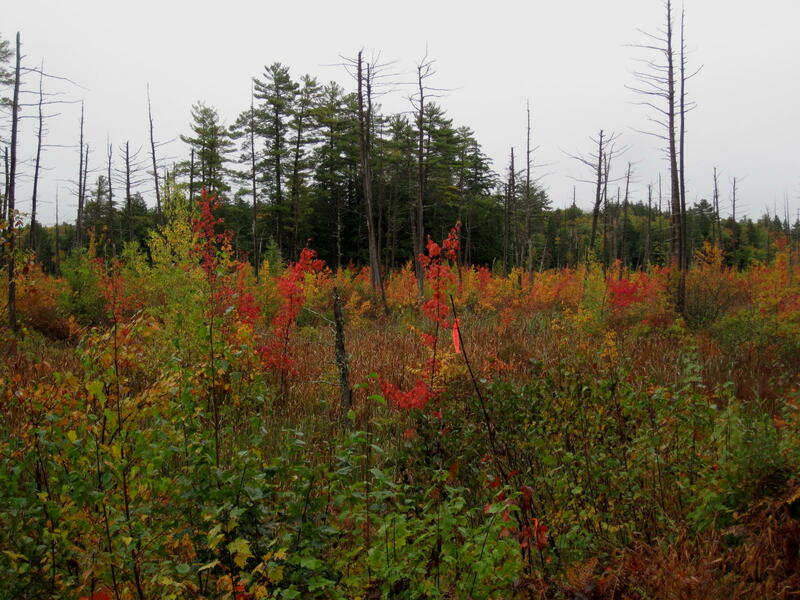 Over time the pond has drained, and filled in as the wetland plants grew and died each year. 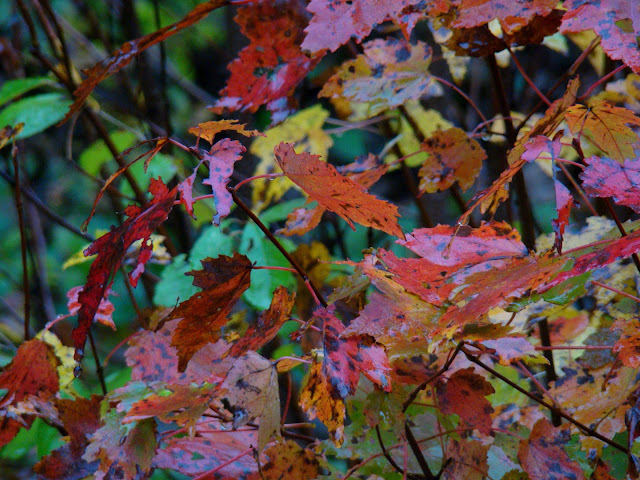 At this point, it is dry enough that Red Maple is starting to reclaim the area. Red maple is also known as "swamp" maple due to its ability to grow in very wet ground. 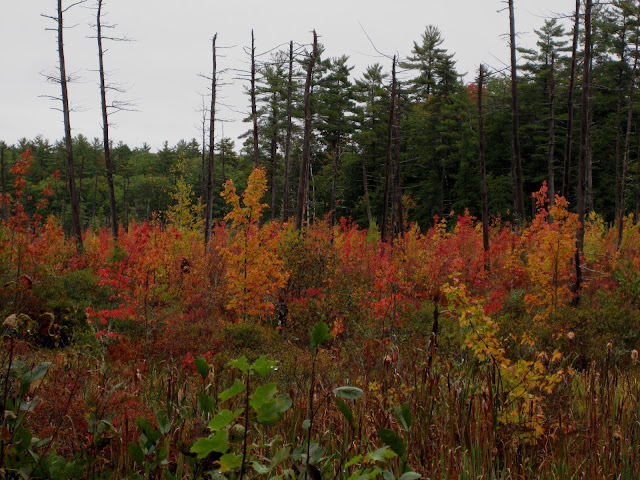 As these trees grow, their leaves will deposit more organic material on the ground and their roots will pull more moisture from the soil, creating conditions suitable for more tree species, and the forest will reestablish itself. 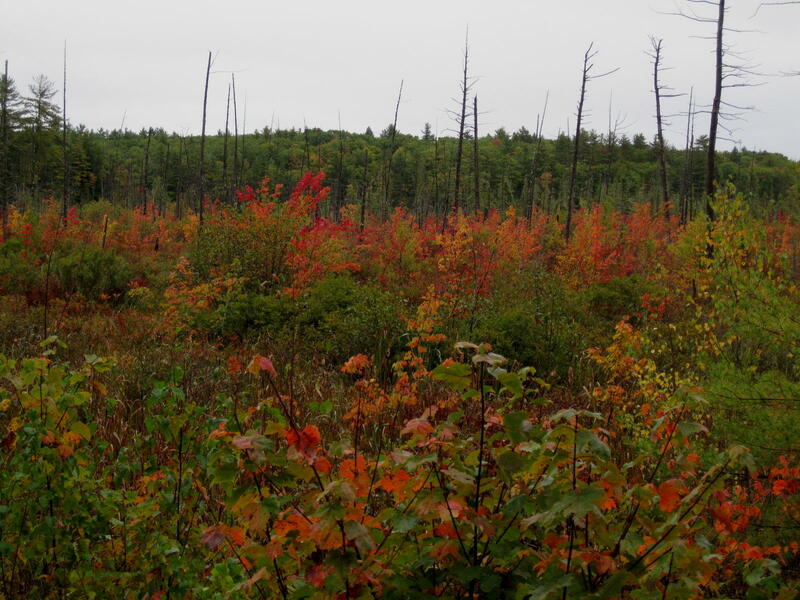 At which point, the beaver may come back to harvest the trees again, and the cycle might repeat. Until then, different animals will enjoy the wet habitat, and we'll enjoy the bright red maples. 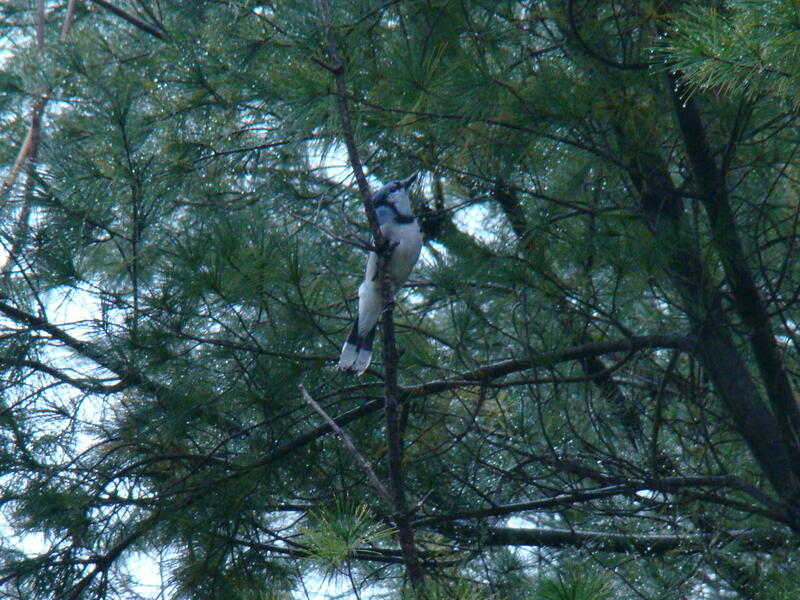 The jays were mostly high up in the trees, especially the pines, flitting from branch to branch, though one came down low enough for me to see it had a large red berry in its beak. Blue Jays, like Gray Jays, will cache food to use later, but this flock appeared to be migrating. There were perhaps two dozen of them, and they moved slowly across the area over a period of five or ten minutes. 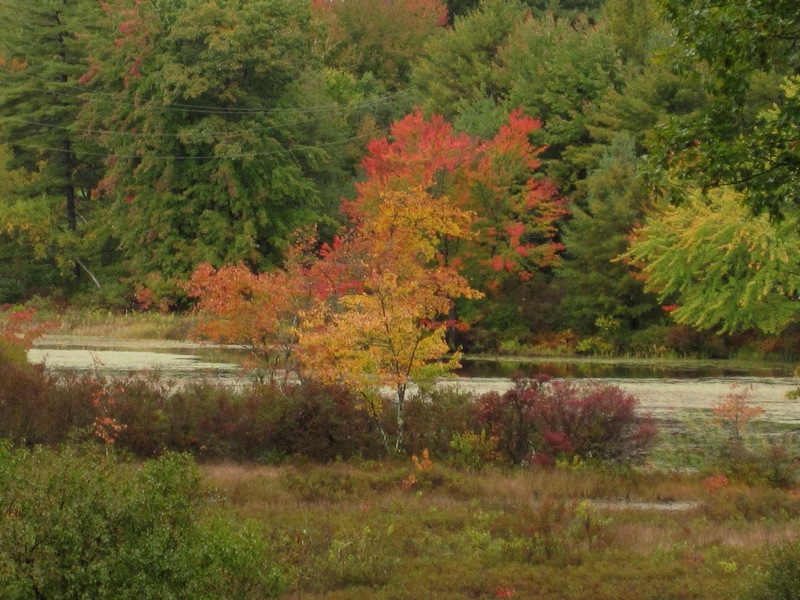 By next week we should see many of the trees in the lakes region approaching their peak colors.